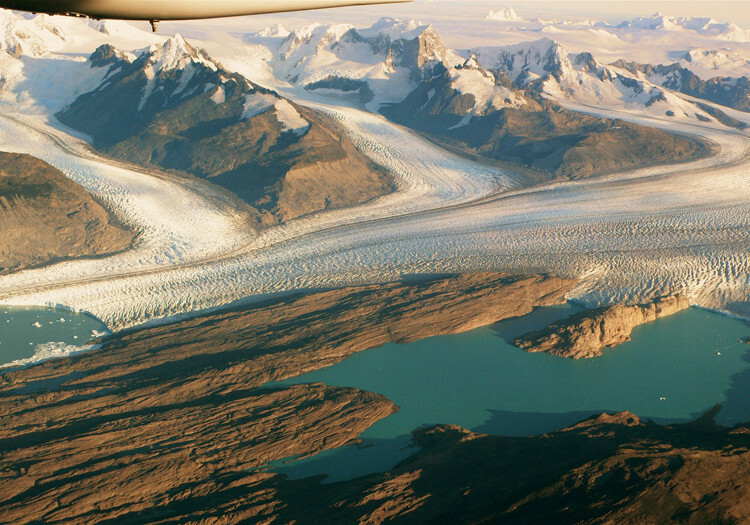 13 glaciers stem from the ice field at a low height to pour into the lakes. On the Argentine side, 13 glaciers stem from the Patagonian ice cap and flow into Argentino and Viedma lakes: Marconi, Viedma, Moyano, Upsala, Agassiz, Bolado, Onelli, Peineta, Spegazzini, Mayo, Ameghino, Moreno, and Frías. The largest are Viedma (575 km2), Upsala (870), and Perito Moreno (250). They are all protected by Los Glaciares National Park, which is covered by ice over more than half of its 2,600 km2. Glacier formation occurs by compression of snow layers which are accumulated, crushed, and the air is forced out of it turning the snow layers into a compact mass of ice. Under gravity force, a glacier may slowly move along its slop, between mountain walls, and may reach gigantic sizes such as those of Perito Moreno, Upsala, Viedma glaciers. The more compact the ice is, the less white light can be filtered, only rays of short wave can be filtered causing glacial ice to appear with this peculiar blue color. Over centuries, glaciers transport and trap rocks, pollen grains, and sediments which are precious testimony to Earth history. 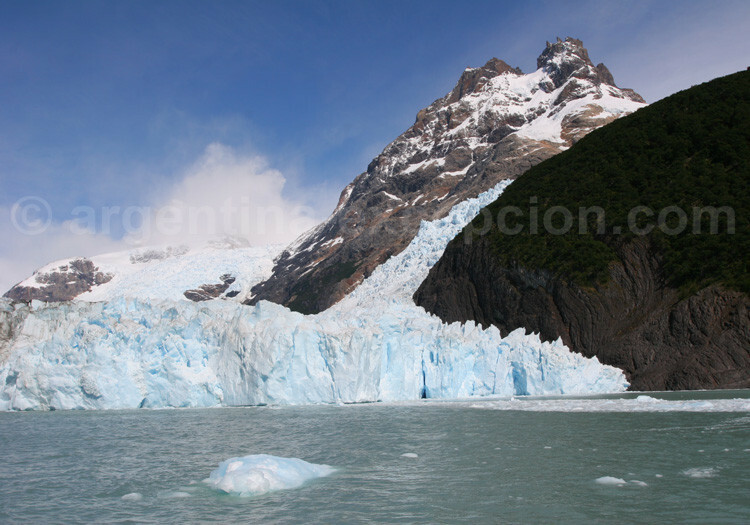 Perito Moreno is the most famous and visited Argentine glacier. This glacier is especially visited when it is about to break off, an unforgettable and stunning spectacle. In fact, its front is permanently advancing. Pieces of ice calve permanently from its front of 5 km and 60 m high with roars and thunders, forming pentagons in the lake. When its front collides with earth, at the end of Magellan peninsula, it ends up causing a breakdown in the lake’s south branch, Brazo Chico, and increasing the lake water level. 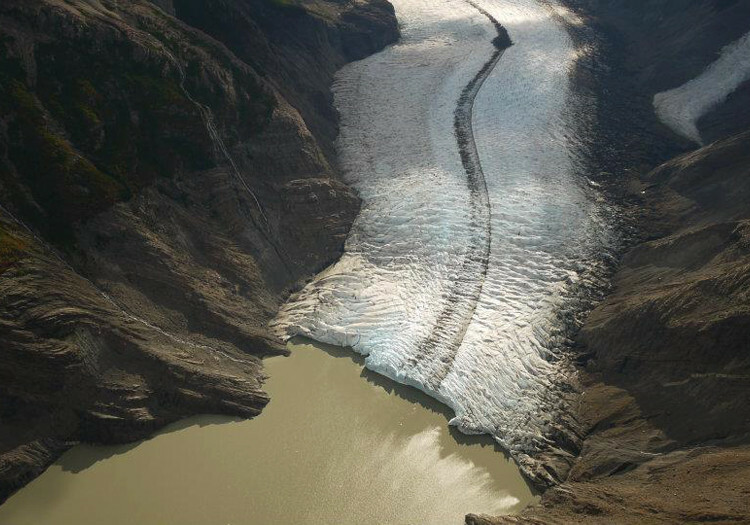 The high pressure of waters on the glacier causes infiltrations and break downs : A huge mass of ice comes off and fall down into the lake causing a tidal wave. This stunning natural phenomenon does not occur regularly: Within the recent period, this occurred in 1980, 1984, 1988, 2004, 2006, and the last break down took place in July 2008. It is also possible to walk over Perito Moreno. 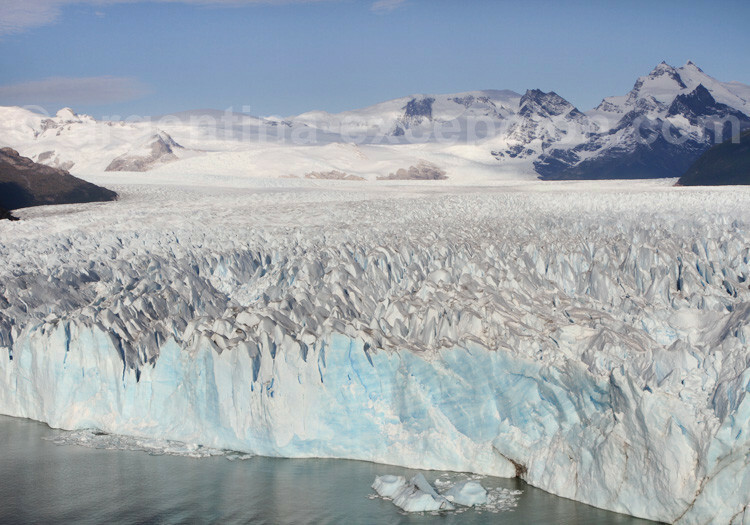 Upsala glacier, the largest Argentine glacier, is a true colossus. 60 km long, two fronts wide, 70 m high, 870 km2! From a boat trip, visitors can only see the west front. Its surface is so plain that armed forces based on Antarctica train there and planes can even land on it. Spegazzini glacier, which is much smaller, is impressive for its walls’ height: up to 135 m. Situated in the north, near El Chaltén, Viedma glacier, is the largest after Upsalata: it is about 80 km long and 5 km wide. 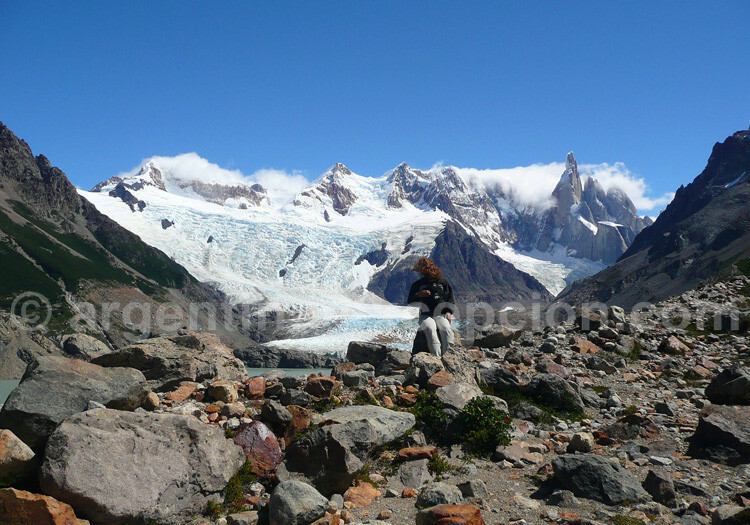 – Our trip information about Patagonia. – Our tips data sheet about El Calafate and its glaciers.